A tasty starter, easy to prepare and suitable for vegetarians. Toss the mushroom slices in a non-stick frying pan with a little garlic and parsley sauce for 5 minutes. 2. Place on each crostini. 3. 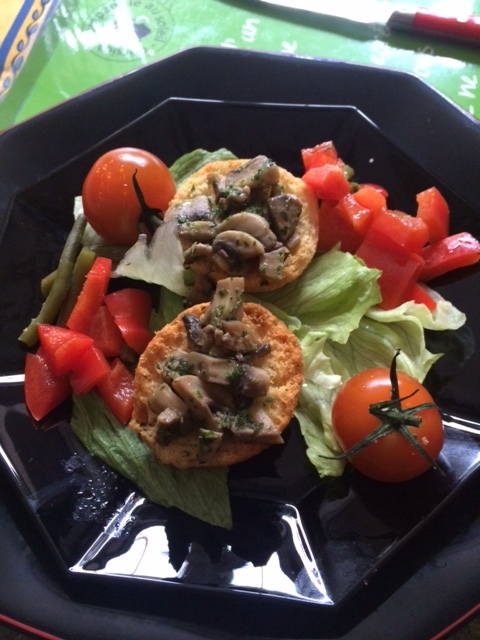 Put lettuce leaves, pepper, beans and tomatoes on a plate, drizzle with vinaigrette and add the crostini on top. Crostini are slightly bigger croûtons, made by slicing a baguette and placing it in a very hot oven until golden. Tip: Tinned mushrooms and green beans are perfectly suitable if you haven’t got some fresh ones available. There are so many apples available at present that I like to try to use them in a different way. For this sorbet, Bramleys seem ideal. The sorbet can be used as a dessert or in a middle of a meal as a Trou Normand. A Trou Normand is usually a small portion of sharp sorbet that will help the digestion. It provides a welcome rest during a big meal. The use of Calvados will complete the Norman connection. This spirit is well atuned to apples since it is made from apples. If Bramley apples are not available , they can be replaced by any other variety of apple. A variation of the Trou Normand is made with lemon or lime sorbet with vodka. 1. Prepare the sugar syrup by disolving 125g sugar in 10ml water. Let it cool. 2. Stew the apples in a saucepan in a sufficient amount of water to cover them then put the purée through a sieve. 3. When both syrup and apple purée are cool, add the lemon juice and the Calvados and pour into the sorbet maker. Alternatively, if not used as a Trou Normand, allow the sorbet to warm up a little before serving. Tip: Do not be too generous with the Calvados as alcohol does not freeze and the sorbet may not have the desired consistency. As a child, I remember going with my mother to the fishmonger to buy the local Mediterranean crabs called favouilles and coming home with a huge cornet of strong brown paper which was closed at the top. This was a wise precaution because the crabs were sold alive. They had a blueish colour which was to change as they cooked and turned a pretty red. On one occasion, the inevitable happened and the last crabs to be immersed in the water were near the top of the pot, on their poor friends who were already turning red. A few managed to escape and climb out of the pot, falling on the kitchen floor and running in my direction. It was a scarry experience! The only consolation was that they were extremely tasty, served with saffron rice. This is one of my earliest culinary childhood memories and one I treasure, in spite of the fright it gave me. Now, something strange and unexpected happened. I went to the beautiful Old Port early this morning and watched the fishermen arrive and unload their small boats. One of them had colourful cages and I knew they would contain the live favouilles. I looked at them, desperately trying to escape from these cages and suddenly, the prospect of killing them by immersing them in boiling water was no longer providing the anticipated pleasure of the palate. I took a few photos and left without buying them. Many people around me did not have any qualms and bought them happily. I shall do this recipe with crab meat instead! There are variations on its composition and for this recipe, I add fennel. 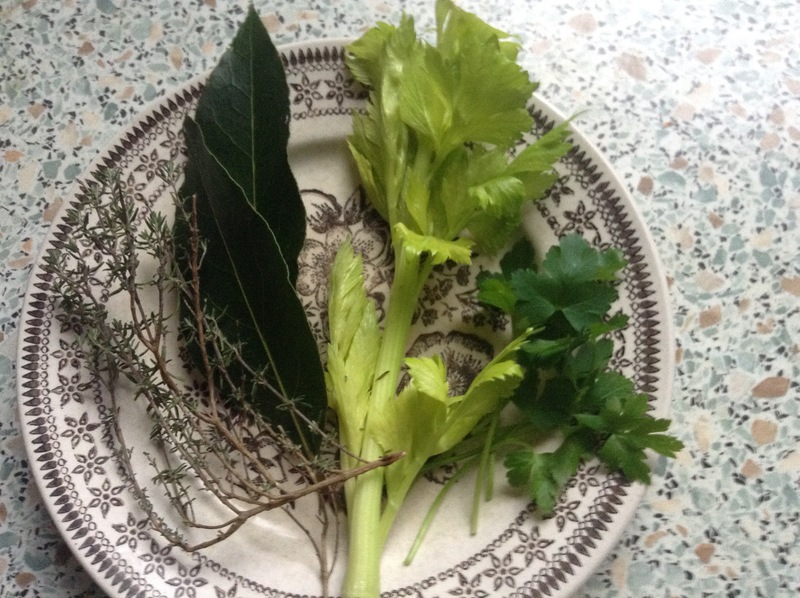 You need: a sprig of parsley, a sprig of thyme, a bay leaf, a celery branch. 1. In a large cast iron casserole pot, gently heat the olive oil. Add the onion and the garlic. When the onion is golden, add the tomato. Let it simmer, stirring regularly. 2. Bring 2 litres of water to the boil in a big cooking pot, add the bouquet garni and the live crabs. When the crabs turn red, remove the bouquet garni and the crabs. Reserve the broth and add 10ml dry white wine. Remove the crab claws and crush them with a small kitchen mallet. 3. Put the crabs and their claws in the cast iron casserole pot and gradually pour a small quantity of the crab cooking broth over and stir. Add the rice and the saffron. Add more broth, a ladleful at a time. After 15 minutes, when the broth has been absorbed by the rice, serve in a large dish. 4. To eat the crabs, open the shell with the point of a knife and remove the gills. The flesh from the claws has to be sucked. 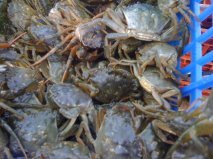 Tip: if you cannot find small live crabs, try a Cromer crab, already cooked, or tins of crab flesh. Happy Ending! : I have now been told that there is a humane way of cooking the crabs by putting them in a pot of cold water which is then brought to the boil. The crabs simply go to sleep as the temperature rises.